Rocco enjoys his Drinkwell Avalon Fountain by PetSafe! It's pet hydration month and there's no better time to make sure your pet is drinking enough water. 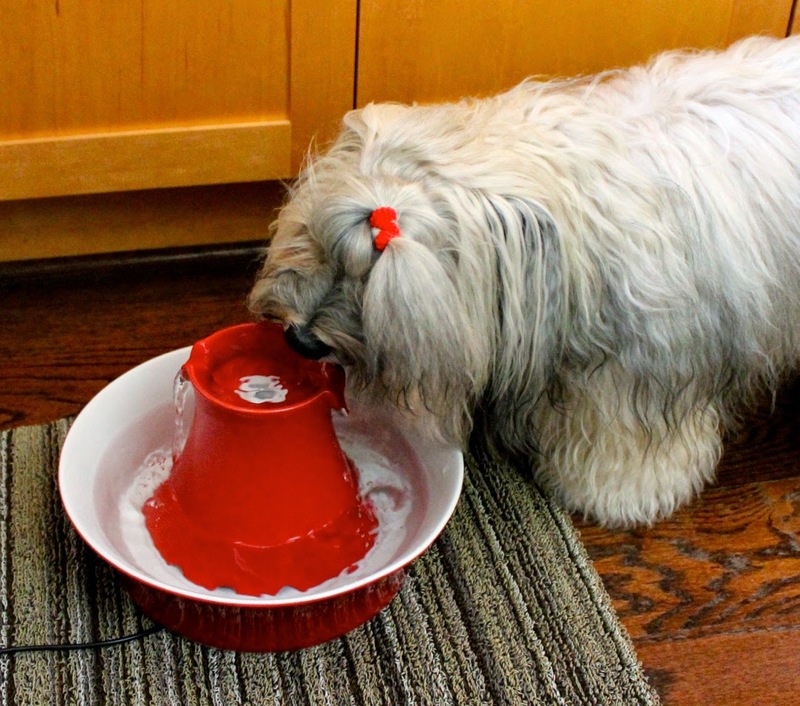 We've got a solution for you that Rocco just LOVES -- the Drinkwell Avalon Fountain by PetSafe. And today, here's your chance to win one for your own furry family members! Read all the way down to enter our giveaway. But first, here are some important things to know about pet hydration. You've likely read that you need to drink about 8-10 glasses of water a day. That actually can vary according to your size, diet, activity level and other factors. The same types of factors apply to your pet, but generally speaking, a dog or cat should drink about an ounce of fluid a day per pound of body weight. Check out some of these interesting facts from our pals at PetSafe. So how can you ensure your pet gets enough water a day? One way is to make drinking fun! Water is tastier from a fountain! I really can't explain WHY Rocco thinks drinking out of a fountain is so much fun, but I CAN tell you that he will walk past his regular water bowl to the fountain to eagerly lap water from it's gently falling stream. I enjoy the soft trickle of water in the background, and I like that the fountain filters the water and looks great too! I found the Avalon Fountain easy to put together and clean, once I did it once or twice. I clean it about once a week (the recommended amount) to ensure that the motor and filters don't clog up. You'll probably want to purchase some extra filters to have on hand, so you have them when you need them. This fountain comes with both a charcoal filter (which should be replaced every two to four weeks) and a foam filter (which should be replaced every four to eight weeks) to help everything run smoothly and keep the water cleaner and fresher. Here's a really helpful video from PetSafe that shows you how to clean the fountain motor. The fountain holds 70 ounces of water and it's best to keep it pretty full. So I add about a glass and a half of water every day (about the amount of Rocco's daily requirement). If you have more dogs, you'll want to keep an eye on the water level and fill it more often. How to win a Drinkwell Avalon Fountain by PetSafe! The fountain comes in both red and white, you'll get your choice! Enter by filling out the giveaway widget below. Enter as few or many ways as you like. But remember, the more ways you enter, the more chances to win! PetSafe provide the Avalon Fountain for us to review and one to give away. Prize will be shipped to the winner by PetSafe. All opinions expressed herein are our own. Wow, that's a lot of water for a little guy! Do you think Ferrets would drink out of a fountain? My dog Drago has to get a drink and cool off in the creek or pond after a short session of fetch. He goes for 8-10 retrieves and then heads to the water. He will also put his front feet in the horse's water trough as he gets a drink. When we are inside I try to put ice water in their bowl. I have a. 14 year old dog that hangs out in the ac and not far from the water bowl. Our old kitty is the same way. What a beautiful fountain! :) I would love to have that for the kitties and Niles. Also, it's funny that you posted this because we just did a video where we talked about how much water a dog needs per day. I was really surprised at how much they need to drink! Running around like a maniac when he's already hot! Even just a walk in the hot summer makes my girl thirsty. Great infographic and good to remind us all during the hot Summer. We always take water with us in a portable dog bowl. Would not be without it. Have a terrific Tuesday. What a lovely little fountain! PAWsome! Earl and I @ Earl's World! Running around with toys makes my dog thirsty. I always add a bit of extra water to my dogs' meals just to be sure they get enough. For Wilson it is a toss up between cat and squirrel chasing. Both make him drink a lot. My dogs love going to the park. They run all around and get thirsty and tired. It doesn't take much we live in the south so it gets really hot. When my dog Bullet plays ball for just a few minutes he gets really thirsty. Especially during the hot summer days, going for walks and just playing in our yard can tire my pack and make them thirsty. I keep a number of bowls of water around for them and am constantly rinsing and replacing the water in them to keep it cool and fresh in an attempt to get them to drink more. I still worry they aren't drinking enough. Casey works up a powerful thirst running at the 40-acre dog park known as "Dog Disneyland" (Marymoor Park)...running, leaping, exploring! We love our outdoor water bowl. It is the same one as the indoor one, but we are funny that way. I think this fountain would be a hit with the cats at my house too. That looks a lot easier to clean then our old Drinkwell that needs to be replaced as last time Mommy was cleaning it she broke something on it. We likes drinking out of fountains too. It would look great in white at our house. OH hot weather makes us thirsty, it's too hot here to be very active. But Fenris runs around like an idiot barking at TURTLES and then has to drink lots of water. Taking Bean for long walks or having her run outside with her friend (a Rhodesian Ridgeback) make her thirsty! Going on hot Summer walks and playing in the park make Luma a very thirsty pup! Everything makes my little dog thirsty! Especially in the heat recently, she needs a drink after even the shortest trip outside. Thanks for educating Mom and Dad on how much water we need! Love your fountain, dude!! I have 3 dogs and a cat, and I'm constantly refilling and refreshing their water bowl. The largest dog seems to always be drinking! Running around during the summer really makes them thirsty. I always have a bowl of water set up for them. Playing outside in the sun makes my Min Pin thirsty! Winnie the cat has never been a great water drinker, but i am tryig to encourage him to drink more. My dog gets thirsty after he's done running in the backyard. Being cats the activity that makes them want a drink is either eating dry food or sleeping. My cat seems to get thirsty on hot days. My dogs romp and play and end up drinking out of the koi pond. We go for walks in the morning! Playing fetch at the park. he gets thirsty from all that barking at the squirrels. My dog gets thirsty from chasing critters in the back yard! Playing w his brothers! ! I have a cat with a urinary tract issue, so tho it's not really an activity....he needs to drink a lot of water. Agility and playing with his flirt pole. Other than that, it's hard to get Shiloh to drink. Florida is so hot and my dog and cat looove fresh water. I put out two bowls every day and exchange the water at least twice. They (andI) would really love a fountain. My dog loves to play chase in the yard. Brutus the Boxer gets thirsty by chasing squirrels and playing tug with his brother Buster. My old guy Wyatt gets thirsty just walking around outside when it's sunny out. Chasing a ball makes her thirsty. SC heat in summer. have to drink lots and give them ice cute treats to keep hydrated. My dogs are pretty active. The activities that make them most thirsty are playing frisbee or fetch, and playing with the flirt pole. Not much will make him thirsty now, especially with this heat. Outdoor playing will do it for sure. taking my dogs to the dog park makes them thirsty. I drink a lot of water and my new kitty brother drinks a LOT of water for his size!! Chasing her rope when we throw it for her. Randomly running around the house like a crazy thing. Then he gives me such a glare, as if to ask what I'm staring at. My lab will retrieve until he falls over. He gets thirsty running with me. Running in the yard playing with me and the kids makes my dog Marley really thirsty. Going for long walks makes my dog thirsty. Going for walks always makes my pup thirsty. Playing games with their toys makes them thirsty! I like to take my dog to our local park and let her run off leash. even at 12 years old she takes off like bat out of heck. she tires her self and she is never so happier. Playing fetch and tug of war with my dog in the yard seems to make him very thirsty. I take my dogs running in the park with me, that makes them thirsty. Playing fetch makes my dog really thirsty. Well, for starters my big guy, our St Bernard gets thirsty from every activity, including sleeping.....i guess moving around that kind of weight does make you a little thirstier. My smaller guys get thirsty from running or playing fetch, or going for walks. We're in the south, and it's always hot and muggy here. i have water bowls all throughout my house, just for that reason lol. It's always tough to remember to stay hydrated! I make it a point to add water to Bella, Terra, & Kronos's dinner to make sure I know they are getting some water.